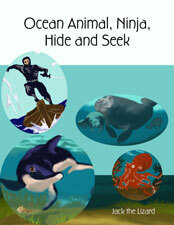 "Ocean Animal, Ninja, Hide and Seek"
Ocean animals and Ninja both do hide and seek for survival. Some are hunters and others are hunted, they ingeniously adapt or train themselves to life in natural environment. Once in a while some animals help each other for their welfare. Ninja spent the same way of life too. It is also important for them to connect with other lives. No food, No water!! Grizzly Bears stop eating and drinking during the hibernation in winter. No wonder they are so hungry when they wake up in spring. Let's have some fresh vegetable!! 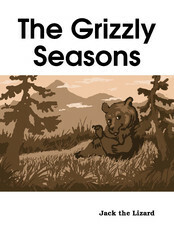 "The Grizzly Seasons" was the Awarded book at “the Contest for Illustrated books worthy to read worldwide 2010” by e-Bookland Inc.
Alexis is an Ocean Detective Agent. 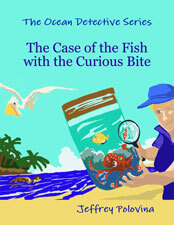 One day, Miguel, a fisherman, asks her to solve the problem he has in his work. 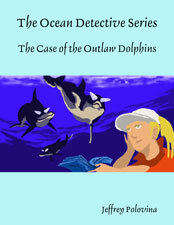 Some dolphins appear and steal the fish off from his hooks. 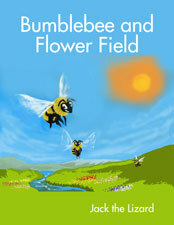 But curiously they do not eat them and just play with them. What are the dolphins doing and why? Alexis dive into the sea to find out. What will she find and can she solve this mystery?